Procon Technology has searched all over for these value-for-money switch-mode DC-DC converters, DC-AC inverters, Chargers and Uninterruptable Power Supplies (UPS). Please see prices below and email us regarding your quantity requirements or special application. OEM, wholesale or trade discounts are available. In Australia, call 03-98306288 now to buy! Meanwell, also provide industrial power supplies from 15W to 10000W, mains power adapters from 12W to 280W and LED Power Supplies! Now available from Procon Technology... DC-DC converter modules. NEW! 15W to 240W DIN RAIL DC-DC CONVERTERS! click here. The Meanwell SD series of switch-mode DC to DC converters provide an industrial style enclosed power supply that operates from batteries or other DC sources. e.g. 12V (option A), 24V (B/L), 48V (C/L) and 96V or 120V (D/H). Note the SD-100D and SD-150D also allows 85-132VAC operation! The SD range comes in wattages of 15W, 25W, 50W, 100W, 150W, 200W, 350W, 500W and 1000W and in output voltages of 5V, 12V (10V to 16V), 24V (21V to 30V) and 48V (45V to 53/60V). Refer to the standard range of industrial 110VAC to 240VAC power supplies for DC voltage inputs of 120VDC to 370VDC or the DIN mounted range DRH, DRT and WDR for voltages up to 780VDC - click here. All SD converters have a 2 year warranty. SD-500 and SD-1000 have a 3 year warranty. Most SD units may be DIN rail mounted and surface mounted using hardware available from Meanwell - click here. Applications include: Efficient conversion of 24V battery power in trucks and other vehicles to 12VDC or other regulated voltages. DC-DC converters also provide isolation between voltage source and load (prevents earth loops) and can be used to provide a remote DC voltage that's properly regulated (e.g. when long cables cause poor regulation, noise and voltage drop). The Meanwell RSD range of DC to DC converters and are designed for low power railway and mobile (metro, subway, bus, tram...) applications. Suitable for cabin electrical equipment, radio communications and entertainment equipment, ticketing systems, video surveillance equipment and low voltage LED lighting on trains and in other public locations. In addition, they are also suitable for harsh industrial installations where dust and moisture are a concern, such as security systems, DC UPS systems, and telecommunications etc. The RSD-100 is designed as a direct replacement for the Absopulse range of MIM-50R converters. Nominal input voltages include 24V, 48V or 96V-110V DC (36V and 72V with RSD-300) with wide (EN-50155) input ranges. The RSD-100 unit delivers 100 Watt DC at 5V (20A), 12V (8.4A) or 24V (4.2A). This unit is housed in a compact 68 x 36 x 161mm vented chassis-mounted enclosure, and weighs 600g. It operates over -40°C to +70°C with no derating if mounted on a base plate. The RSD series meets the requirements for the EN50155 railway certificate (also IEC60571, IEC61373, EN50121-3-2) for electronic equipment used on railway rolling stock, EN55022 Class B and EN50121-3-2 conducted and radiated EMI, and EN 61000 immunity standards.This converter is fully ruggedized and conformal coated, and meets IEC 61373 shock and vibration standards. It has around 90% efficiency, 4KV DC input to output isolation, inrush current limiting and reverse polarity protection at the input. Over-voltage, overload and short circuit protection are incorporated. Overtemperature protection is provided on units > 100W. Can be DIN rail mounted using the DRP-01A plate and a Meanwell DIN rail clip (DRP-04). NEW! The RSD-30 and RSD-60 series are now available with 3.3V output and 12VDC input options. Also available are the RSD-150, RSD-200 and RSD-300 with 48V output option and Over Temperature Protection (OTP) with automatic recovery! The Meanwell RSP could replace units from Amtex, AbsoPulse, Martec Power, Polyamp, PowerBox, Railgroup, Snaptec such as; B110, BAP200R, BAP236R, DCW100R, RWY100, RWY150, RWY200, PSE100, PM80, PM150, PM240, PU300. Also could replace CABAC CCI rail products WR150E, WR150EQ, WR200E, MR150E and MR200E. Multiple units could be used to replace CABAC MR850E and 24WR500E. The entire RSD range provides operation up to 70°C... this is ideal for "hot" Australian conditions in industry, transportation and mining! The Meanwell DDR series of DC to DC converters provides wattages of 15W, 30W, 60W, 120W and 240W and in output voltages of 3.3V, 5V, 12V (9V to 14V), 15V, 24V (24V to 28V) and 48V (48V to 56V). The 15 to 60W units provide 9..36V(G) or 18..75V(L) input. The 120W and 240W units are designed for railway applications and provide 9..14V(A), 17..33V(B), 34..67V(C), 68..154V(D) inputs. The 120W and 240W units also provide 150% peak current output. The 240W also provides remote on/off, a DC OK output and parallel operation up to 960W. All DDR converters have a 3 year warranty. The Meanwell A301 and A302 range provide low-cost Modified Sine Wave (MSW) DC to AC inverters in 100W, 150W, 300W, 500W, 600W, 1200W, 1700W and 2500 Watts with 230VAC 50Hz output. Each inverter can be supplied in 12V or 24V DC input. Designed for 100% load at 30°C and derated to 50% at 40°C. These MSW inverters are useful in intermittent or occasional (backup) operation and are capable of powering many types of 240VAC devices with some restrictions. Please contact Procon Technology for advise. A one year warranty. Click here for 1000W, 1500W, 2500W manual. TS range of inverters (above right) - Designed for permanent installations with 100% up time! The Meanwell TS range provide a True Sine Wave (TSW) DC to AC power inverters in 200, 400, 1000, 1500 Watts with 240VAC output. These inverters can be used in continuous operation and at high temperatures (100% load at 40°C derated to 75% at 50°C and 50% at 60°C). Each inverter can be supplied in 12V, 24 or 48V DC input and each has a standby saving mode and adjustable output. i.e. 200, 220, 230, 240VAC and 50 or 60 Hz. The Meanwell TSW inverters provide low noise operation of audio equipment (Hi Fi, TV, satelite receiver, radio equipment). And they work best with most appliances, including flourescent lights, incandescent lamps (inc. dimmer), laptop or desktop computer equipment (LCD display and ink-jet printer recommended), telephone equipment and most small appliances - we ran our 150w 26 inch CRT TV, Hi Fi, digital set top box, DVD player and Wii game console all from one TS-400 unit during an 8 hour power shutdown! Motor driven tools and equipment that start under no-load conditions (fans, vacuum cleaner, drills, saws, grass trimmers, hedge trimmers) work well with these inverters even if they are speed controlled and also when motors are rated higher in wattage than the inverter (remember under full load, it could trip the inverter). Motors which start under heavy load conditions such as compressors and pumps normally will not work with an inverter because they require up to 10 times the current at start up! However, "soft-start" air-conditioners and refrigerators and some small units may work - please consult the manufacturer. A Meanwell TSW inverter will ensure that motors run cooler, microwaves cook faster and clocks keep better time! They are useful in caravan, mobile home or motorhome applications as well as for emergency power in the home, office, farm or factory. Other applications include - yachts or boats, trucks, tractors and remote location. The TN-1500 and TN-3000 are great for solar charging in Mobile Homes! All Mean-well inverters have a low battery voltage alarm and are protected against; reverse battery polarity, low battery voltage shut-down, over temperature, output over-load and short-circuit. The Meanwell TSW or Pure Sine Wave (PSW) inverters also have output abnormal (too high or too low) voltage protection and high battery voltage shutdown (with alarm). All have an on-off switch. All are fitted with 240VAC Australian power sockets (TYPE-C). The TS-1000, TS-1500, TN-1500, TS-3000 and TN-3000 models now have conformal coating on the PCB for added protection against moisture and dust! Click on the part number below to view the data sheet (PDF file) showing specifications. SD-25n-v, 25W DC-DC v = 5V, 12V, 24V... n = A, B, C $54.00 $59.40 . SD-50n-v, 50W DC-DC v = 5V, 12V, 24V... n = A, B, C $63.00 $69.30 . SD-200n-v, 200W DC-DC v = 5V, 12V, 24V, 48V... n = B, C, D $160.00 $176.00 . SD-350n-v, 350W DC-DC v = 5V, 12V, 24V, 48V... n = B, C, D $180.00 $198.00 . SD-1000n-v, 1000W DC-DC v = 12V, 24V, 48V... n = L, H $520.00 $572.00 . DDR-15n-v, 15W DIN DC-DC v = 3.3V, 5V, 12V, 15V, 24V... n=G, L $45.00 $49.50 . DDR-30n-v, 30W DIN DC-DC v = 5V, 12V, 15V, 24V... n = G, L $60.00 $66.00 . DDR-60n-v, 60W DIN DC-DC v = 5V, 12V, 15V, 24V... n = G, L $70.00 $77.00 . 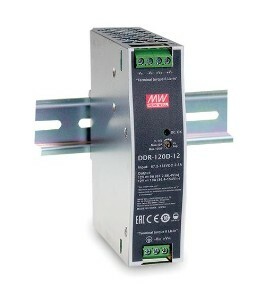 DDR-120n-v, 120W DIN DC-DC v = 12V, 24V, 48V... n = A, B, C, D $120.00 $132.00 . RSD-30n-v, 30W DC-DC v = 3.3V, 5V, 12V, 24V... n = G, L, H $60.00 $66.00 . RSD-60n-v, 60W DC-DC v = 3.3V, 5V, 12V, 24V... n = G, L, H $80.00 $88.00 . PSD-30n-v, 30W DC-DC v = 5V, 12V, 24V... n = A, B, C $36.00 $39.60 . PSD-45n-v, 45W DC-DC v = 5V, 12V, 24V... n = A, B, C $45.00 $49.50 . A301-100, 100W (200W surge) inverter 12VDC with USB (0.5A) $60.00 $66.00 . 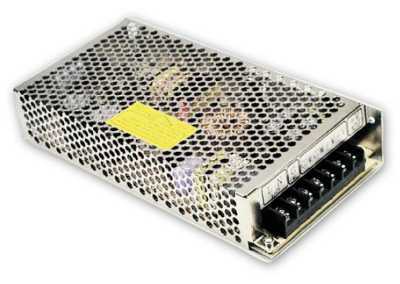 A301-150, 150W (300W surge) inverter 12VDC or 24VDC (A302) $63.00 $69.30 . 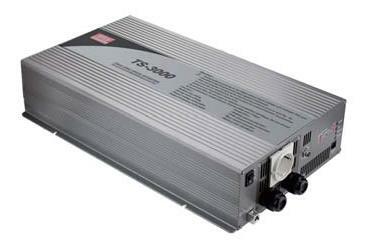 A301-300, 300W (600W surge) inverter 12VDC or 24VDC (A302) $90.00 $99.00 . A301-600, 600W (1200W surge) inverter 12VDC or 24VDC (A302) $180.00 $198.00 . RSP-750-v, 750W SMPS v = 15, 27, 48V... V+I adjustable $360.00 $396.00 . HEP-1000C-v, 1000W SMPS v = 24, 36, 48, 100V... V+I adj. 3 stage . . u.d. RSP-1600-v, 1600W SMPS v = 12V, 24V, 27V, 36V, 48V... V+I adj. $720.00 $792.00 . RPB-1600-v, 1600W SMPS v = 12V, 24V, 48V... V+I adj. 3 stage $800.00 $880.00 . RST-10000-v, 10000W SMPS v = 24V, 36V, 48V... V+I adjustable $4000.00 $4400.00 news! RCB-1600-v, 1600W Charger v = 12V, 24V, 48V... V+I adj. 3 stage $900.00 $990.00 news! RHP-1Un, 19" 1U rack system for 1..5 x RCB-1600 - HOT SWAP! $800.00 $880.00 . DRC-40n, 40W UPS DIN rail, n = A(13.8V), B(27.6V) $60.00 $66.00 . DRC-60n, 60W UPS DIN rail, n = A(13.8V), B(27.6V) $70.00 $77.00 . DRC-100n, 100W UPS DIN rail, n = A(13.8V), B(27.6V) $100.00 $110.00 news! SCP-35-v, 35W UPS module v = 12V(13.8V), 24V(27.6V) $45.00 $49.50 . SCP-50-v, 50W UPS module v = 12V(13.8V), 24V(27.6V) $50.00 $55.00 . SCP-75-v, 75W UPS module v = 12V(13.8V), 24V(27.6V) $60.00 $66.00 . AD-55n, 55W UPS module n = A(13.8V), B(27.6V) $80.00 $88.00 . 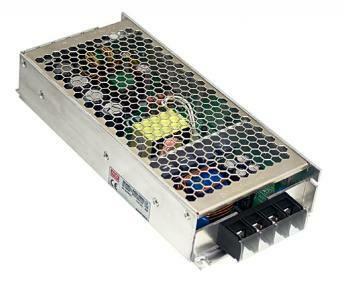 ADD-55n, 55W UPS module n = A(13.8V), B(27.6V) + 5VDC $90.00 $99.00 . ADD-155n, 155W UPS module n = A, B, C + 5VDC $150.00 $165.00 . Delivery charge within Australia $11 (trade & express bag orders - $16.50). More for discounted orders or large orders to WA, NT and remote QLD. EX-GST purchases may only be made when the delivery address is outside of Australia. i.e. for EXPORT orders. Prices subject to change without notice. DC-DC Converter Mounting brackets: The following power supply brackets may be used with the SD range; SD-15 = RS-25 (931 case), SD-25 = S-25 (905 case), SD-50 = S-50 (901 case), SD-100 = S-100 (902 case), SD-150 = S-150 (906 case), SD-200 & SD-350 & SD-500 = SP-320 (912 case), SD-1000 = RSP-1000 (952 case). The RSD range can now be DIN rail mounted using the DRP-01A plate and DIN clip DRP-04 or DRP-02. For more information on brackets - click here. The 'Mean Time Between Failure' or MTBF is calculated according to the probability of accidental device failures, and indicates reliability of devices. Therefore, it does not necessarily represent a life of the product. The life expectancy or life cycle of a power supply is most dependent on the electrolytic capacitors used. The deterioration speed of the electrolytic capacitor varies considerably according to the ambient temperature. Generally the speed follows “Rule of Two for every 10°C”; for every 10°C increase in temperature the rate of degradation doubles according to Arrhenius’s equation. The reason Meanwell have such good MTBF specs on in-line or laptop style power supplies is that they use 105°C electrolytic capacitors whereas others use ordinary 85°C caps (open that 'cheap' unit and take a look). Finally, 2017 figures on the '2 year field return rate' suggest that around 1 in 6600 units is ever returned due to faulty parts or workmanship (that's x6 less returns in 10 years). Procon Technology can honestly say, until 2018*, due to Meanwell's extensive burn-in testing, that we have NEVER had a D.O.A (Dead on arrival) nor premature failure of a Meanwell power supply (I wish all the products we sold were like this). The only unit we have had returned within 12 months of installation had a "zapped" nest of ants in it! p.s. We recommend that all power supplies be checked on a regular basis and steps taken to ensure vermin (ants, rats, birds) do not cause mischief! In outside applications, where this could be a problem, we recommend the use of a IP65 or IP67 rated units. e.g. HLG or HEP range. NOTE: An additional method of calculating the MTBF, the Telcordia/Bellcore SR-332, is given on many power supplies. This is considered a more accurate method of determining the MTBF then MIL-HDBK-217 for commercial products. Mean Well Enterprises Co., Ltd. is one of the leading switching power supply manufacturers in Taiwan or ROC. Established in 1982, it is a TQM (Total Quality Management) company and has been ISO-9001 certified since 1994. Besides the Industrial AC to DC power supplies, the product line also includes; mains adapters, LED power supplies and drivers, DC-DC converters, DC-AC inverters and battery chargers. Total Quality Assurance and Customer Satisfaction” are the central goals of MeanWell. They and Procon Technology believe that the industry is one where reliability, functionality and cost are of great importance, but that it is reliability that differentiates the truly superior product. So, every product in the Mean Well range is the result of rigid procedures governing design, Design Verification Test (DVT), Design Quality Test (DQT), component selection, pilot-run production, and mass production. To this end, Mean Well have recently implemented a new and highly efficient Computerized Management System (CMS). This system allows improved administration of sales, manufacturing, purchasing, fabrication management, shipping, customer service, and quality analysis, allowing them to ensure the best CQTS (Cost, Quality, Delivery & Service) for customers. The goal is to offer total solutions that satisfy customer's requirements. Mean Well have earned their good reputation based on the quality, competitive prices and punctual delivery of products. This reputation has enabled Mean Well to enjoy an average of 28% sales growth in the past few years. For the company profile - click here. 'Mean Well' may be a name that is unfamilar to you. Mean Well specialize in power supplies... or power related products only! As for the name itself 'Mean Well' or 'MW' should stand for 'Manufactured Well' but the name, which was translated from Chinese, means more than it's dictionary definition - 'to have good intentions'. It may, or may not, surprise you that Mean Well Enterprises has adopted Confucius Analects as part of its corporate culture, 'Honesty and Sincerely', 'Active and Responsible' and 'Harmony and Unity'. The message from the President (Mr Jerry Lin) illustrates the importance the company places on the operation of a humble power supply - "If the CPU is the brain of a system, the power supply is it's heart, and often the value of losses incurred in a single failure can exceed the value of the power supply itself." Note, Meanwell has been awarded the 'Taiwan Superior Brands' title for 2010... and many items have been awarded the "Taiwan Excellence Product Award".